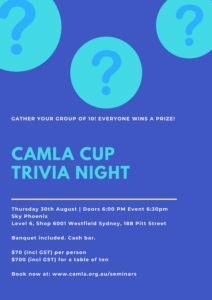 CAMLA’s annual night of trivia fun is on again! Thursday 30th August. Sky Phoenix, Level 6, Shop 6001 Westfield Sydney, 188 Pitt Street, Sydney. Book a table of ten or an individual ticket to join a team. Ticket includes banquet. Cash bar. Everyone wins a prize!